True fact: President Donald Trump has had one of the worst weeks of his presidency. Another true fact: As the November elections approach, confidence in the economy is running high among consumers and businesses. When it comes to the U.S. economy, President Donald Trump has stayed surprisingly on-point - and factual. It might be because the economy is doing so well. This week, the president was embroiled in a media firestorm over a new book by Bob Woodward -- one of the former Washington Post journalists who helped bring down Richard Nixon - that describes the Trump White House as a "crazytown." Trump's also ranted against the "Deep State" after the New York Times published what it said was an anonymous opinion piece by a senior administration official describing efforts from within to "frustrate" his agenda. His mood is "volcanic," NBC News reported Thursday, citing multiple aides and allies familiar with his thinking. But in a series of Twitter posts in recent days, Trump has gushed ebulliently over the success of his economic policies. "The economy is booming like never before," Trump tweeted Thursday. And why wouldn't he? The data are on his side. A series of reports and surveys support Trump's on-message argument, and most economists agree: Jobs are bountiful, with wages on the upswing, and consumers and businesses are feeling confident about the future. 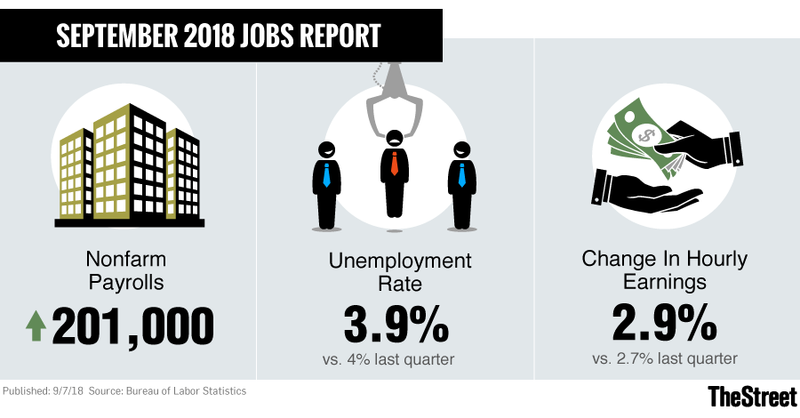 A report Friday from the Labor Department showed that the U.S. added 201,000 jobs in August, higher than the average estimate of 189,000 in a survey of economists by the data provider FactSet. Workers' average hourly earnings rose by 2.9%, the fastest pace in nine years. The unemployment rate, at 3.9%, is close to an 18-year low. For a president besieged by swirling questions - even from some lawmakers within his own Republican Party -- about his competency and morality, the strength of the economy could become an important talking point as the November elections approach. The president's approval rating is so bad that Republicans are likely to lose control of the U.S. House of Representatives, says Steve Blitz, chief U.S. economist at forecasting consultancy TS Lombard. But voters' optimism about the economy will limit the damage to Trump's party, helping Republicans to keep control of the Senate, he predicts. "Confidence in the economy is extraordinarily high, and that's usually good for any sitting president," Blitz said in a phone interview. Trump is a newcomer to politics and has struggled to stay on message, with a habit of tweeting erratically, often with spelling and punctuation errors. But he and his top economic officials have stayed remarkably consistent when it comes to talking up the momentum in the economy. "These other stories are not the big deal," Larry Kudlow, Trump's National Economic Council director, told CNBC on Friday. "The big story in 2018 is an economic boom that most people thought impossible, but it is happening before our eyes. This argument has the added benefit of being factually true." The nonpartisan website PolitiFact says it's examined nearly 600 statements made by Trump and found some 69% to be "mostly false," "false" or "pants on fire." Only 31% were "half true," "mostly true" or "true." The Washington Post says it's documented at least 4,700 false or misleading statements by the president since he took office in January 2017. Such a record might help explain why Trump is so unpopular, when compared with prior presidents. According to calculations by TS Lombard's Blitz, Trump has a "net disapproval rating" of 14 percentage points - essentially the percentage of voters who disapprove of the job he's doing minus the percentage who approve. That compares with a net 4.3% disapproval rating for Bill Clinton in 1994, when his Democratic Party lost 52 seats in the U.S. House of Representatives. But when it comes to consumers' confidence in the economy, Trump is riding high. The University of Michigan's consumer-sentiment index stood at 96.2 last month, which, while down from a high of 101.4 in March, is still higher than in all but a few monthly readings during President Barack Obama's eight years in office. Obama was much more popular than Trump ahead of the 2010 midterm elections, with a net disapproval rating of just 3.2 percentage points. Nevertheless, the economy was still struggling to emerge from the 2008 financial crisis and ensuing recession; the consumer-sentiment index stood at 61.2 that year, and his Democratic Party ended up losing 63 House seats. Blitz predicts that Democrats will gain 30 House seats in November, enough to take control of the chamber. "The odds favor a marginal Democratic takeover based on Trump's negative net approval rating and its drop since his inauguration, offset by strong confidence in the economy," Blitz wrote this week in a report. It goes without saying that the economy's momentum isn't fueled by any innovative or imaginative programs started by Trump, but simply by the president's promised rollback of business regulations and the tax cuts passed last December, which showered corporations with fat profits and put some extra cash in consumers' wallets. The loss of tax revenue to the U.S. Treasury has ballooned the federal deficit, pushing the national debt past $21 trillion - meaning that taxpayers will eventually have to pick up the tab for Trump's indulgence. Many economists predict that the current expansion cycle will come to an end sooner rather than later, as the fillip from the fiscal stimulus fades. And Trump's threatened trade war with China has unnerved corporate executives, prompting some of them to delay or cancel planned investments in new equipment, plants or business expansions, according to the Federal Reserve. Such a pullback could sap future growth. But for now, and probably for the next couple months, all's going swimmingly. The Federal Reserve Bank of Atlanta's GDPNow tracker, which aggregates economic data points to provide a real-time estimate of economic growth, puts the third quarter's pace at an estimated 4.4%, the fastest in four years. Last month, the Standard & Poor's 500 Index set a new record for the longest bull market in history - at more than 113 months. And the Labor Department report's wage readings Friday provide yet another talking point for the administration. Some critics of Trump's economic stewardship have argued that the tax cuts have merely lined the pockets of wealthy business owners, executives and investors, leaving ordinary workers behind. It's been a sore point for the Trump administration. Just this week, Kevin Hassett, chairman of the White House Council of Economic Advisers, presented a 30-page report quibbling with how wage data are presented. But with the latest jump in annual wage growth to 2.9%, workers have at last caught up with the inflation rate: The consumer price index also is up 2.9% over the past 12 months. In other words, employees are no longer falling behind, relative to the cost of living. "This report on the margin will help support that argument," says Peter Cramer, senior portfolio manager at the $17 billion fixed-income money manager Prime Advisors. "As much as Trump can claim credit for the performance of the economy, the lack of wage growth is something that, in particular, the Democrats had been criticizing." The idea wasn't lost on Kudlow: "Jobs, growth, wages," he told CNBC. "Doesn't get much better than that." For Trump, as the midterm elections approach, it could be a lot worse.